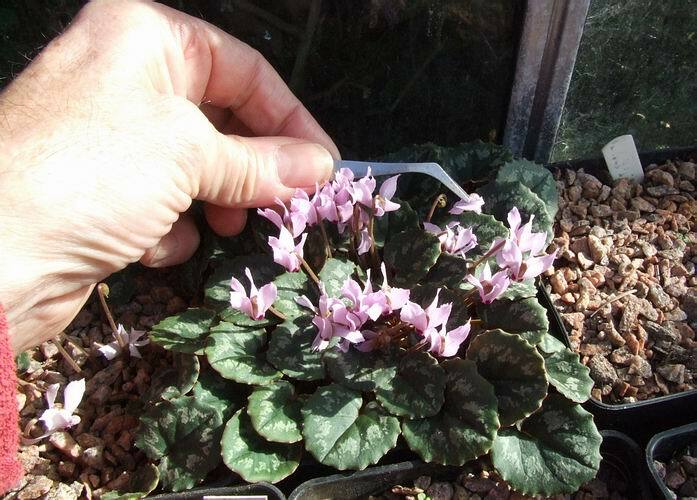 The best flowering plants in the bulb house just now have to be Cyclamen mirabile, they are really coming into their own now as more flowers have opened and the leaves have developed. Sometimes the leaves are not so well developed when the plant is in flower and this could be due to a number of factors. It could be that this clone will always flower in advance of the leaves or it could be to do with cultivation - being planted deeper, kept drier, etc. It is very important to be vigilant and remove the flowers as they drop off onto the leaves because if you do not they will start to go mouldy and that mould will transfer to the leaves of the plant which is not desirable at all. 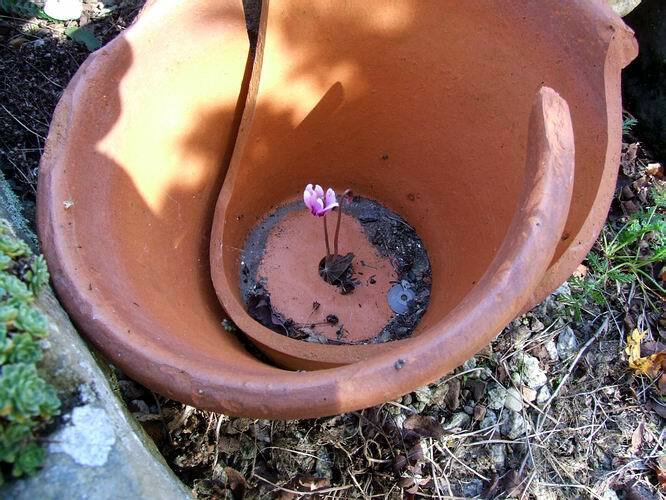 Talking of potted cyclamen and planting them deep - this is not what I had in mind. 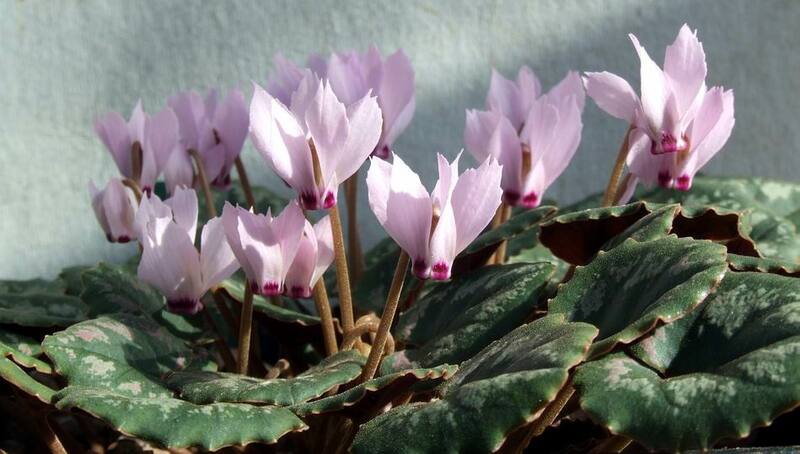 This poor Cyclamen hederifolium is struggling to find the light since I placed a broken pot on top of it when it was dormant in the summer. I know I should have tidied it away or thrown it out because it is broken but this is one of our nice old pots and I cannot bring myself to part with them - I will glue it with some epoxy resin glue. 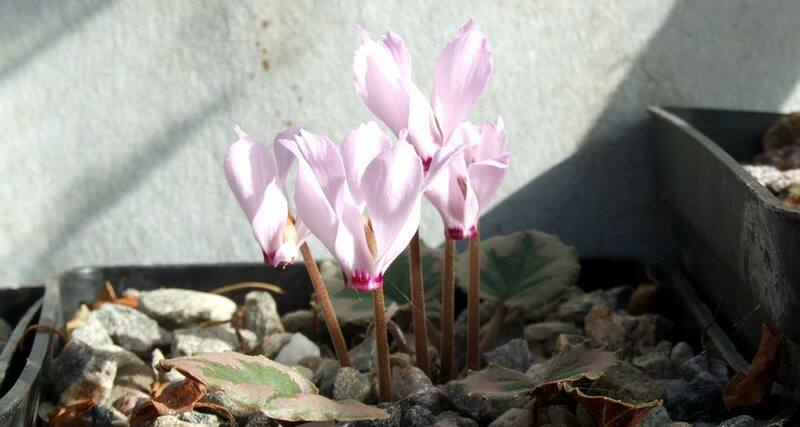 The first flowers of Colchicum agrippinum are appearing now; these are some early risers in a fish box trough which should be covered in flowers as it is full of flowering sized bulbs - this just illustrates how erratic flowering can be. Here is one flowering in a garden bed where a number of flowers have appeared in the last few days. Garden bulbs tend to flower more evenly than container grown ones because the soil temperature and moisture level tends to be more stable and even, unlike a container where bulbs at the edges may be warmer and drier than those planted towards the centre. 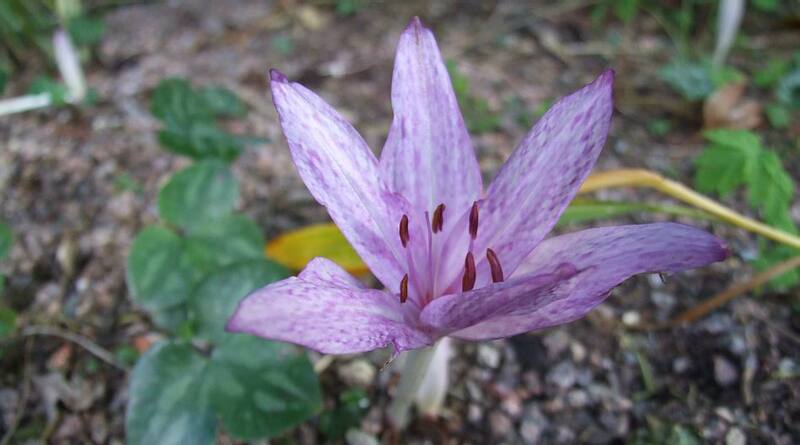 This is a nice dark Colchicum that we bought a number of years ago as 'Atrorubens' but I do not think that is the correct name for this plant. 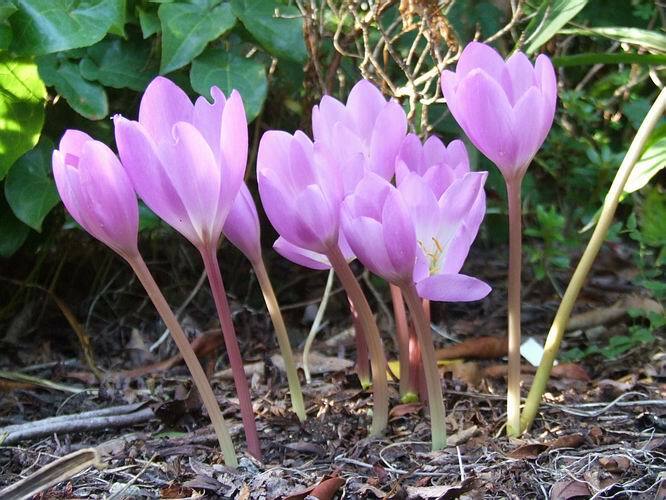 The form of Colchicum 'Atrorubens' that I want to get hold of is a much shorter and even darker colour than this one is. 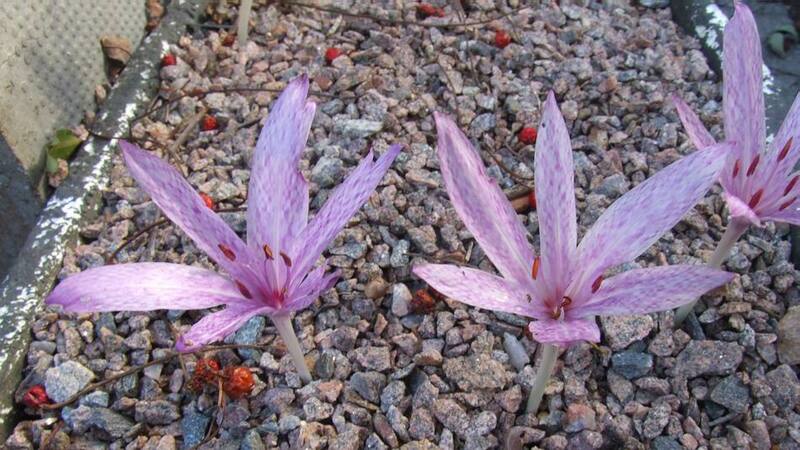 However it is a nice plant with large flowers and is most likely just a good selection from Colchicum speciosum. 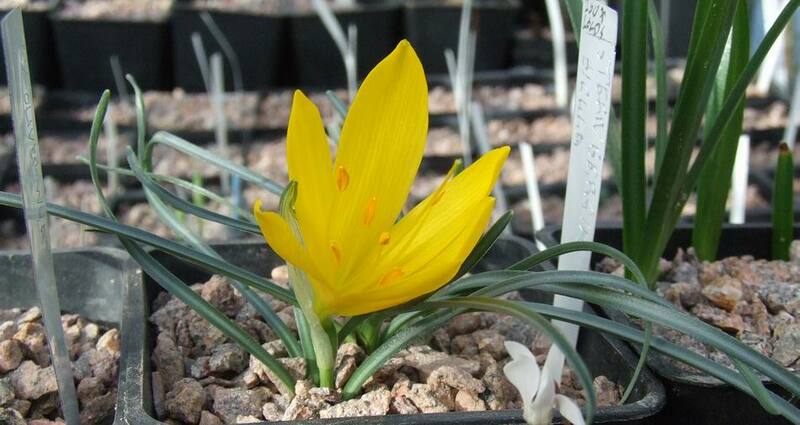 For the last several years I have only managed to get one flower in this pot of Crocus kotschyanus ssp harkariensis. This subspecies differs from the type in that the corm lies on its side so it is oriented vertically. 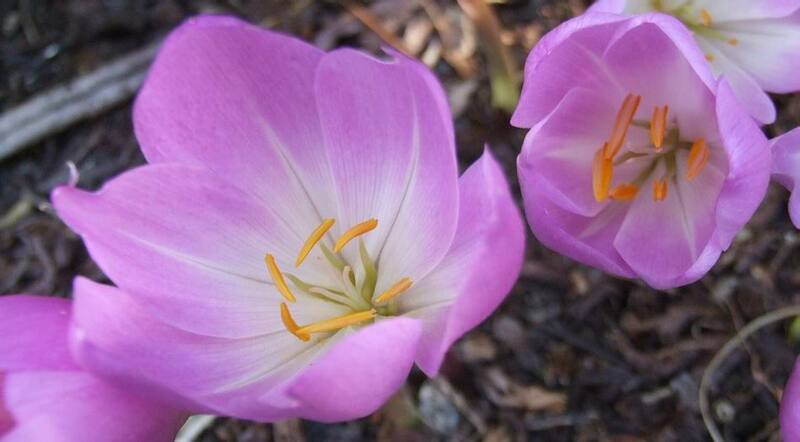 If you repot it every year and place it flat as per a normal crocus corm you are unlikely to notice this side ways habit as it takes a couple of undisturbed years for the corm to turn it self fully sideways again. 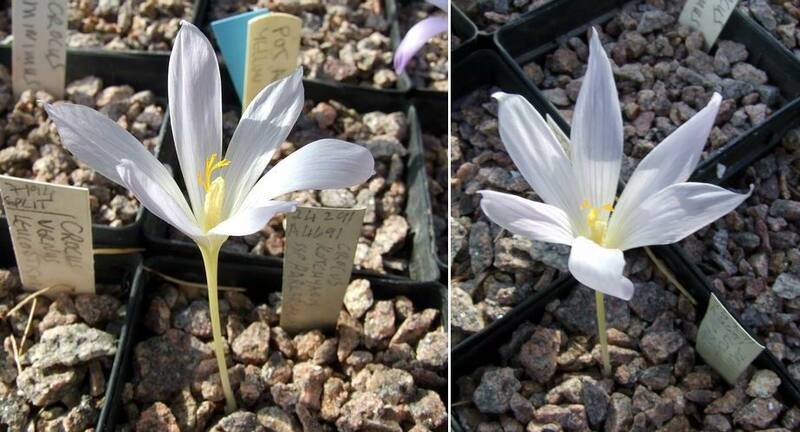 It also has a paler flower with very indistinct throat markings than other forms of Crocus kotschyanus we grow, also the petals have an acuminate (thread like) tip. There has been some interest in Sternbergia greuteriana so here is a side-on view which shows just how extended the style and stamens are when the flower is fully opened. 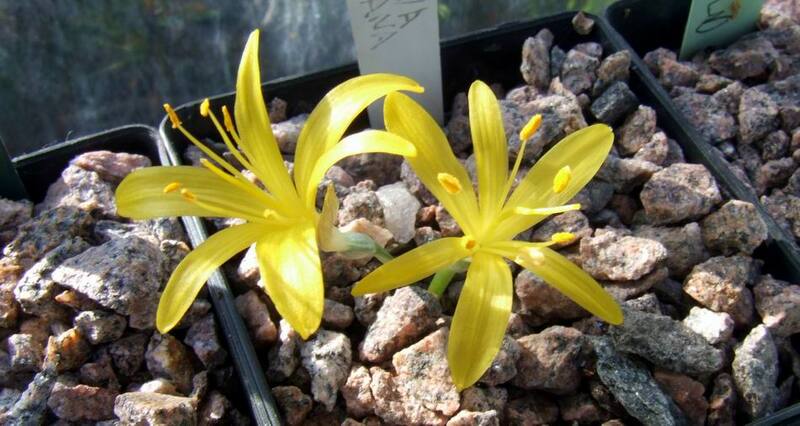 As the warmth of the sunshine heats up the bulb house both the flowers open fully. 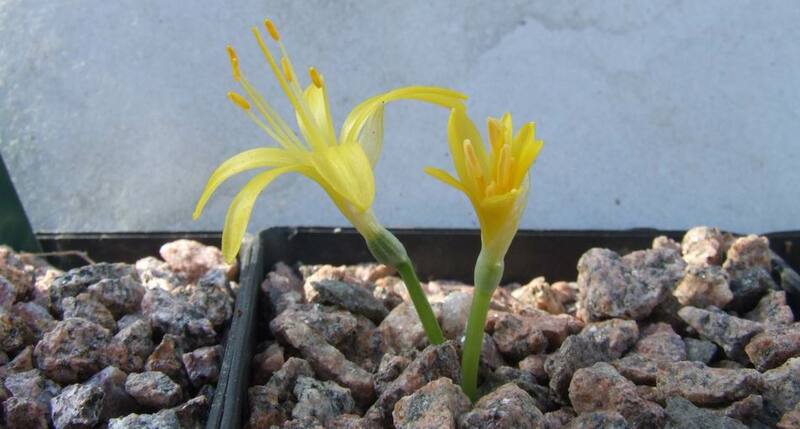 Here is the first flower on a form of Sternbergia sicula that I received from Ron and Jane Leeds on my recent visit to speak to their AGS Group. It has the typical narrow low lying leaves and a tremendous large flower - what a stunning form. I cannot wait to compare it with some of my other forms but I may have to just that, as I do not manage to get them to flower every year and so far there are no signs of any flower buds. 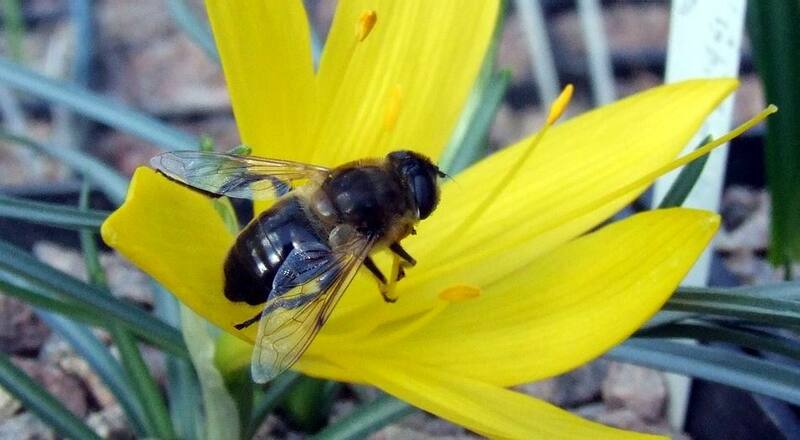 It is not just me that is attracted to this beautiful flower, this hover fly of some kind also finds it irresistible. I am delighted to announce that thanks to the hard work and generosity of Len Rhind from Canada we now have an index for the bulb log from 2004-2007. Len has created it for his own use but is happy to share it with us all it is in the form of a pdf file and you can down load it from the bulb log index page. There have been many requests for an index so I am sure you will all want to join me in thanking Len for his hard work and generosity.